A confused pile of books for term papers and IPCAA archaeology qualifying exams that I need to cart back to the library. The end of the “winter” term at U of M marks not only the end of classes and preparations for summer work, whether in the field or stateside. For IPCAA students in their first three years, the end of the winter term also marks IPCAA exam time. IPCAA students take a lot of exams before advancing to PhD candidacy: beyond exams in courses, we have to pass four language exams (Latin and Greek, and German and French or Italian), a qualifying exam in ancient history, and archaeology qualifying exams in three major areas (Egypt and the Near East, Prehistoric Aegean and Greek, and Etruscan and Roman), and preliminary exams (preliminary, that is, to a dissertation). The language exams occur throughout the school year, but the other three exams occur just after the end of each academic year. First-years take the ancient history qual; second-years take “Quals” (the archaeology exams); and third-years take their prelims, on topics they’ve chosen in consultation with faculty members. Thus, if you visited the Kelsey during the first week of May, you may have seen some dazed, ermm, I mean, well-rested, calm, and chock-full-of-knowledge-looking graduate students wandering around the building. The goal underlying Quals is ensuring that IPCAA students gain a foundational understanding of the major subject areas of our field, which will allow them to develop their research focus informed by knowledge about major sites, monuments, and theories while also equipping them with the resource base to teach about these different areas. As such, studying for and taking Quals is an exercise in solidarity and solidification. Solidification, because we are asked to consolidate our understanding of facts, developments, theories, and trends so that we can redeploy all these things to answer new questions. Solidarity, because taking Quals is an experience (or labor) undergone by individual cohorts together, but that also unites IPCAA cohorts across time, on what I imagine is a sociological or ritual rites-of-passage kind of level. Not only have we learned similar material, but we’ve all sat and written essay after essay, slide ID after slide ID for hours (twelve actually), after months of studying and anticipation. As a second-year in IPCAA, I, with my three cohort-mates, just took Quals. Afterward, when corresponding with an IPCAA alumna with whom I work in the field about our upcoming fieldwork, I sensed a sigh of relief in her congratulations to me for having the exam in my rearview mirror. Before entering IPCAA, I received an MA in Latin from the University of Georgia, which involved passing a “Reading List Exam” in March of our first year in the program. In the frenzied studying for that exam, my cohort quizzed each other on writers, works of literature, and historical events. Since then, I have not forgotten that the Roman playwright and Stoic Seneca was forced to commit suicide by Nero in 69 CE, along with his nephew, the poet Lucan, because a classmate came up with the mnemonic soundbite that Seneca and Lucan “died in each other’s arms” (not strictly true but will be forever ingrained in my memory). Similarly, I think (or hope) I will never forget my go-to examples of the mixing of the Doric and Ionic orders on temples (Temple of Athena, Paestum), or where the Stone Law Code Stela of Hammurabi was found (Susa) and why that matters. Thanks, cohort-mates, for getting me through this IPCAA milestone! The Kelsey Conservation Lab recently hosted two hands-on conservation workshops for PhD candidates in the Interdepartmental Program in Classical Art and Archaeology (IPCAA): one covering ceramics and the other copper alloy (bronze) conservation. 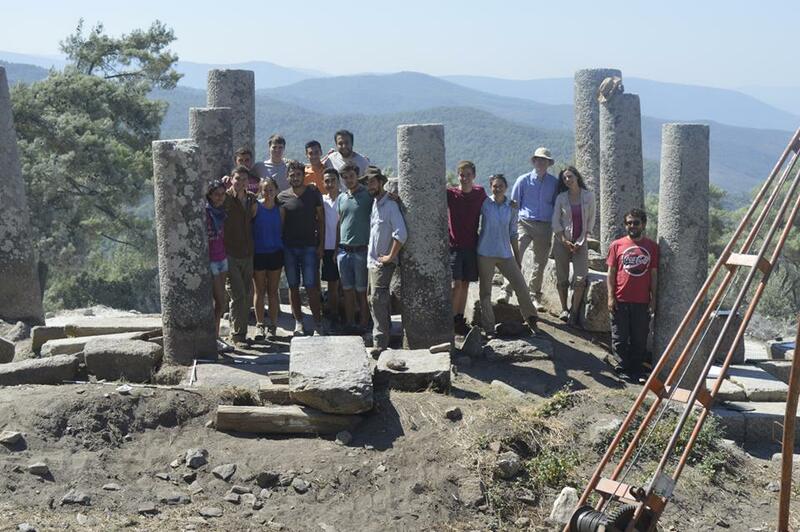 Our goals were to help familiarize the students with archaeological conservation best practices, learn about condition issues and field recovery, and gain some useful hand skills. In essence, we wanted to provide them with conservation information they could take with them into the field. The first workshop covered ceramics conservation, beginning with an overview of deterioration phenomena. We spent some time looking at artifacts that demonstrated springing, spalling, and other structural condition problems; and we talked about lifting, transport, and temporary storage, as well as long-term ceramic storage considerations. We then proceeded with the hands-on part: the smashing and subsequent reconstruction of thrift store ceramics (the most challenging object proved to be the purse-shaped cookie jar adopted by Shannon Ness). The students learned how to make their own Paraloid B-72, a conservation-grade adhesive, and label their homemade adhesive tubes with hazardous materials labels. Fun times! IPCAA students Dan Diffendale and Alison Rittershaus reconstruct broken ceramics. The second workshop covered copper alloy conservation. This time we discussed deterioration, field recovery, and the goals of cleaning small metal finds (to stabilize artifacts and reveal information). The students participated in a cleaning exercise, where they learned how to use various tools — from bamboo skewers to scalpels — to clean archaeological copper alloy artifacts. They wore Optivisors during this step of the workshop. These magnifiers allowed them to better see the progress of their cleaning. The Optivisors also provided a fun talking point, as they basically transform the wearer into a lab tech/Star Trek-looking character. We finished by making Ethafoam cavity-cut supports for their artifacts and talking about the pros and cons of using silica gel in microclimate storage. Conservator Carrie Roberts talks to the students about copper alloy corrosion. We conservators had a lot of fun working with the IPCAA students. They had many questions for us and participated in the hands-on sections with real enthusiasm. I think they’ll be taking some useful information with them into the field. We’ve benefitted too; teaching drives home the fact that one of the best preservation strategies we have is to share our knowledge with others. We hope to provide interested students with other conservation workshops in the coming years! Since October, I have been living in Naples, Italy, where I have been conducting my dissertation research with the help of a grant from the US-Italy Fulbright Commission. The Fulbright Program supports academic exchange programs for American and international students, faculty, and researchers, and Italy is just one of many countries that participate in a bilateral Fulbright Commission. A view of Naples from a hilltop castle. That very straight street at the lower left is one of the Roman decumani, still in use as a main road today. The beauty of the Fulbright program is that it gives me the time and resources to do my research abroad while encouraging me to serve as a “citizen diplomat,” representing my country and learning about my host country at the same time. I wanted to immerse myself in the culture of Naples, so I rented a room in an apartment with Italian roommates. As it turned out, these were not just any roommates: they are the managers of an experimental theater company (TeatrInGestAzione; see link below). Their principal project every year is Alto Fest, a performing arts festival that puts artists into unusual venues in Naples — terraces, garages, kitchens, even the airport — offered for free by the owners. Artists come from around the world to create and adapt works for these spaces throughout the city, encouraging audiences to explore and connect with Naples on an intimate level. In our day-to-day life in this rooftop apartment, my roommates show me how the arts and cultural heritage can be used for social development and urban renewal in a concrete and personal way. My roommates are not the only young Neapolitans using culture and heritage to change their city for the better. Through my research on the catacombs of Naples I have come into contact with the people of La Paranza, a social cooperative organization that is developing the catacombs and other heritage sites of the Rione Sanità as tourist destinations and sources of employment and local pride. La Paranza organizes concerts, art exhibitions, and other special events in addition to regular tours of the catacombs, and their programs attract locals and visitors alike. Centuries ago, the catacombs were important sites of cult and memory, and in their modern context the catacombs continue to shape local identity and daily life. A view of one of the main galleries in the Catacomb of San Gennaro. That central arch is big enough to accommodate a city bus! Finally, I want to share a few words about my research itself. My dissertation examines three major Italian catacomb complexes (in Rome, Naples, and Syracuse) to learn about the funerary industry in late antique urban contexts. Specifically, I am looking at inscriptions, paintings, and architecture in catacombs for clues about how funerary labor was organized, how laborers balanced customization and “mass production” in their work, and how materials (like marble slabs) were recycled and traded for funerary use. In practical terms, this has meant visiting sites, museums, and archives to study surviving materials and analyzing what I find using an array of philological, art historical, and archaeological methods. One of the broader goals of my dissertation is to consider the roles that ordinary workers played in the shaping of ancient culture, and it has been an invaluable part of this process to get to observe small organizations shaping the culture of a major modern city. For more information on the Fulbright Program, TeatrInGestAzione and Alto Fest, or La Paranza and the Catacombe di Napoli, follow the links below. Arianna Zapelloni Pavia prepares to teach her class. My life as a PhD student is not always easy. The commitment it requires sometimes feels like a heavy load that I am not sure I am handling well. On top of these difficulties, as an international student, I also face the challenge of being far from home. I have learned to accept that I will lie awake on certain nights and think of all the things I am missing out on back home. Suddenly, in my second year, after only three days of training, I entered my first class as an instructor: 25 students are sitting in front of me, some looking at me with curiosity, others still busy with their phones, but all waiting for me to say something. Honestly, I thought I would exit the classroom after my first day feeling unworthy. Looking back, I do not know exactly what happened that day, but as soon as I began talking, the insecurity and anxiety vanished. My fear of being ill equipped slowly faded away and made me realize that I am a young scholar who loves what she does, and facing the challenge of teaching is part of my role as a student. I recognized that I was just being myself, trying to pass on to my students my own energy and passion for the topic. Now, teaching is one of the most stimulating and rewarding parts of my semester. It is amazing to see how the class develops its own personality and reactions to my teaching style. One of the most valuable things I am learning is that humor can be effective in breaking barriers between me and the students. I also noticed that making connections with personal experience helps students see Roman history as something more than just a remote past. Once, while reading Livy, I remarked that Camillus’s feelings toward Rome are the same feelings I have when I think about this city, my hometown. It is when I see that the students are becoming more engaged and are learning new concepts, while at the same time I manage to create a relaxing environment, that I know I am on the right path to one day becoming a professor. Learning is not a one-way street. I, myself, am learning a lot. Every time I leave the classroom I carry with me new insights that I received from my students. Interacting with undergraduates from a wide range of disciplines, who do not necessarily have the background I take for granted, sometimes leads to questions about fundamentals of Roman history that many of us in academia consider self-evident. Moreover, explaining these fundamentals to students helps me to focus on the most important things, to simplify difficult concepts and make them approachable. As a result I have clearer ideas of the topic I am teaching. Teaching is also a refuge for me. When I feel overwhelmed by classes and research, it is very comforting to know that I can still shut everything out of my mind for the two hours I spend in the classroom talking about the Roman Republic.